This post is dedicated to my dear friend Sharla Rae, who has written a wonderful book about life and love in an Oregon lumber camp, ca. 1880s. With hope for its speedy publicatio n! 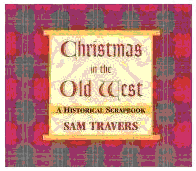 I recently added a gem of a book to my home library: Christmas in the Old West, A Historical Scrapbook by Sam Travers. The following is an excerpt from that book. This article was originally printed in the Anaconda (Montana) Standard on Dec. 17, 1898. There are few city tables that are more heavily laden with good things on Christmas Day than is the long board of the cookhouse at a logging camp. There is a big turkey, of course. More than likely some member of the crew has shot a deer, and the fine, fat saddle of the venison graces the Christmas table. Cranberries have been brought from town, as well as fruit and nuts. There are dishes of steaming vegetables, and there are long rows of pies. There is a big pudding, too, if the cook has been feeling right. The bill of fare is one that would do credit to a big hotel, for these camp cooks are experts and, when they make an effort, the result is sure to be a success . . . .
Outside the door of the cookhouse is suspended a broken circular saw that has been brought up from the mill. The equipment of no logging camp is complete without this. When dinner is ready, the [cook’s assistant] pounds away on this saw with a club, and the resulting sound is one that makes a Chinese gong ashamed of itself. It penetrates to the uttermost parts of the forests, and it is sweet music to the hungry toilers in the woods. On Christmas, at dinner time, this tocsin rings out with a more pronounced tone than usual. It discounts in volume and penetrating power any chime of church or cathedral that ever announced the advent of Christmas Day. Look for another Christmas tidbit from Mr. Travers’s scrapbook tomorrow on Sweethearts of the West. That’s very kind of you to say. I hope you’ll visit again. It’s a beautiful book with lots of illustrations and period photos. I think you’ll enjoy it. Thanks for stopping by!